According to www.snopes.com this is not a joke, it's the real deal. If I didn't know better I'd think you were makin' up a list of excuses to go back to smoking! My mother smoked too and I was born 5 weeks ahead of schedule. Had to be in an incubator and she never got to breast feed me, which she wanted to do. A wee thang I was. But I've sure made up for it. HA! With my son, I quit smoking, oddly enough, 2 months before I conceived...never smoked at all while I was pregnant. He was 3 weeks overdue...I drank castor oil to induce labor, cuz my OB/GYN wanted to wait another week - and that was NOT going to happen as far as I was concerned !!!! My son was 9 pounds 14 ounces....22 inches long...and healthy as a moose !!! That's funny that you bring up the chemical addition thing. My husband's great-grandmother GREW her own tobacco in the back yard, which is what she smoked her whole life. She lived til her nineties, and eventually it was alzheimer's that took her life. Of course the tobacco companies added all the chemicals to make cigs even more addictive. Why do they not care that these chemicals happen to be ones like cyanide and arsenic??? WHO CARES!! People are even more addicted than ever before! BLAH!! 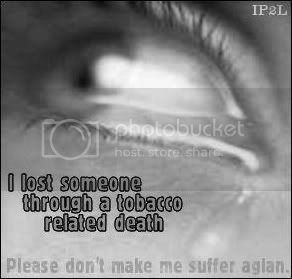 SHAME on the tobacco companies!! It is money and they have no right to do what they do, but to be honest they wouldn't make any money, if we didn't buy. We are responsible for our own actions, just as they are for theirs. 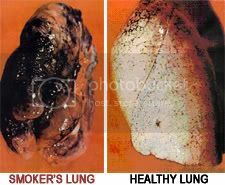 We've known for a long time what cigarettes do to our bodies and we ignored the statistics. "We are responsible for our own actions" oh yeah. 100% responsible. Isn't it great that we are making our own choices now? We've cut off the addiciton and we are in control of the choices we make from here on out. I would not suggest smoking while pregnant or any other time but I think a lot of it unfortunately is dumb luck. My parents both smoked, my Mother through all five pregnancies and we were all perfectly healthy. I remember being in the car with the windows rolled up and both of them smoking....all the time. They smoked in the house, my mother was a chain smoker. Luckily they both quit eventually but not before they passed the nasty habit on to me and my two sisters. Neither of my brothers ever smoked beyond just trying it for some reason. I quit smoking before having my first two children. With the first I didn't even take an aspirin yet he was born early at 5lb15oz and had tons of ear infections for the first year. My second was incredibly healthy and never had an ear infection in his life! I started smoking again and got pregnant and was unable to quit although I did cut back a lot. The third child was born small also at 5lb14oz and had asthma during the first year but no ear infections. Seems to be perfectly healthy now at age 11 though. So from my experience it seemed to be a toss up but I would caution anyone pregnant or considering to become pregnant to quit ASAP! 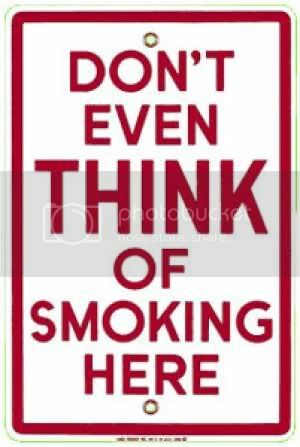 Even if your baby is born perfectly healthy you will live with guilt and regret forever about smoking during pregnancy!